There are hundreds of freeware applications to convert PDF files to other formats but for the reverse process, only few applications are there and that few applications are not easy to use. If you are in need to easily convert your JPEG images to PDF files then here is a freeware JPEG to PDF that can help you for the conversion. It is a standalone program which does not require Adobe Acrobat or Acrobat Reader. It can instantly convert JPEG images into PDF files. In case you want to convert multiple files at once, it supports command line usage, and you can make one “.bat” file to batch convert multiple JPEG files to PDF documents. 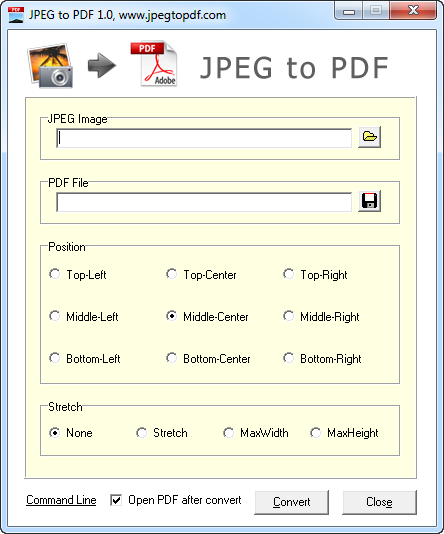 When you choose the image file to convert, it can change the position of the JPEG image in the PDF documents. It can also stretch the size of the images as you want. Don’t understand what might be the need to use this program. All computers (100%) can open jpegs. Not all computers can open pdf. Why should I convert jpegs to pdf?